With the coming and going of St. Patrick's Day recently you are reminded of perhaps the most fortuitous link in history between brewer and church, as one product in particular is elevated to almost ecclesiastical status in the minds of the drinking public - Guinness. What is interesting is that unlike other large scale brewers who may have a number of styles in their portfolio, Guinness is associated with just one style, primarily - Stout. It may come in varying sizes and strengths, pasteurised or nitro kegged, but its association with the 'black stuff' is so strong that 'Guinness' IS Stout. A chameleon of a beer in various guises, but primarily one type. For the brewery itself this has posed a number of problems over the years with changing fortunes in demand for a style that has its roots in the 19th Century, and with less appeal to modern tastes. The brewery has responded to this this with a number of initiatives over the years in an attempt to pin the famous brand name onto new products, with their latest venture being particularly interesting for several reasons. Guinness Black Lager at 5%Alc/vol. has been introduced, so the company say, to appeal to the younger drinker (18-24 sector) who find the traditional stout to heavy in style. It is taking advantage of the move to lager, rather than ale within the age group, which is at the root of Guinness's problem. The twist comes in the colour, rather than golden (which is where the true growth lay) they have opted for dark. Dark lagers are very much a tradition of central Europe, especially the Czech Republic and Germany, and are hybrids born out of the days before lighter malts could be produced on a commercial scale, but using the 'bottom fermented' lager technique that originated in 1842. Prior to this, ironically, the dark malted beers would have been 'top fermented', like Guinness, and although founded in 1759, Guinness did not become a true 'stout' until 1820. Here then we see the curious situation of Guinness embracing a brewing technique that came about some 20 years after the creation of it's famous stout, of which historically, it has no connection. The bottle comes in the familiar livery of the their traditional stout, but there are hints in the wording on the bottles back label as to who the beer is marketed at, drinking it cold from the fridge and from the neck is the inference. So far it has been test marketed in Northern Ireland, and in July 2012 in Ireland itself, with a release also in a number of States in America. It is unclear whether it will be released in the remainder of the UK, dependent no doubt on its fortunes elsewhere. 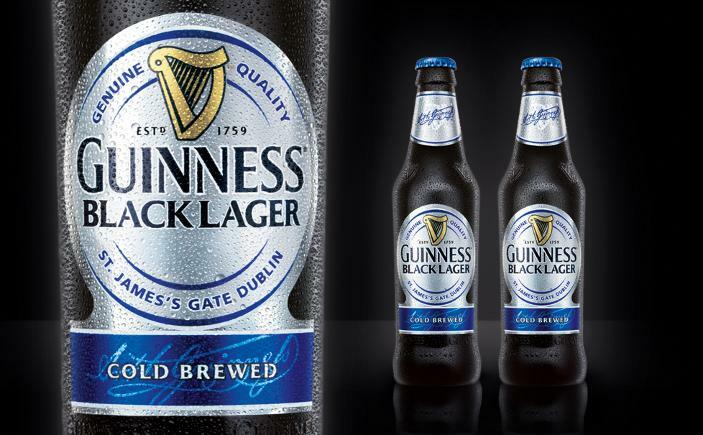 Perhaps its most enigmatic incarnation is in Malaysia, where the same lager is being marketed under the name of Guinness Premium Beer. Time will tell if this latest initiative by Guinness will succeed in connecting with its new audience.